Here’s a nice, easy recipe that is in the latest issue of Cooking Light, where it was a staff favorite. 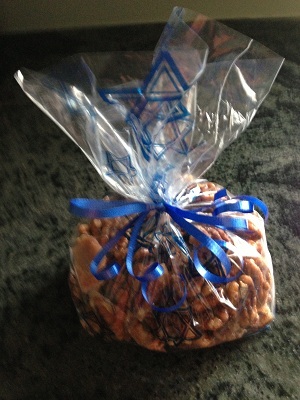 It would be great as a snack at holiday parties or as a hostess gift. It’s also good as a salad topping if you break the walnuts up a bit. You can get sumac in a Middle Eastern grocery or online. If you can’t find it or don’t like it, you can substitute lemon rind. 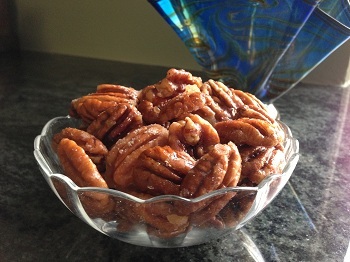 Place walnuts on a rimmed baking sheet or in a large ovenproof skillet. Add maple syrup, sesame seeds, olive oil and red pepper (if desired). Sprinkle with black pepper and 1 tsp. salt and toss until evenly combined. Roast, stirring occasionally, until walnuts are golden brown and maple syrup is caramelized, 15 or 20 minutes. Remove from heat and immediately sprinkle with sumac and remaining ½ tsp. salt, tossing to coat. This is the year’s busiest entertaining season, so whether you’d planning a party or going to one as a guest, you might be able to use these recipes. They’re all terrific and easy, especially the first two. Candied or glazed nuts make a great party snack and they also make a great hostess gift if you’re a little tired of bringing wine. Just pack them in a pretty plastic bag or glass jar and add a little ribbon. These are good recipes to make with kids or grandkids, as long as you’re careful not to let them touch the nuts when they first come out of the microwave or oven, because they are very hot. Stir the sugar into the orange juice. Place the nuts in a shallow glass baking dish and pour the sugar mixture over them. Stir so that all the nuts are evenly coated. Cover with plastic wrap, leaving one corner open to vent, and microwave at MEDIUM for 6 minutes. While the nuts are cooking, line a baking sheet with parchment paper. After six minutes, stir the nuts and microwave at MEDIUM for 4 to 6 minutes more. The liquid should be almost — but not quite — absorbed by the nuts. Turn the nuts out on the parchment paper and spread them out so that they are in a single layer. If you see a small pool of syrup, move some nuts into it. Cool for at least a half-hour, then break into small clumps. Preheat oven to 325 degrees. Line a baking sheet with parchment paper. Combine all ingredients in a large bowl and mix well to coat the nuts. Spread the nuts over the baking sheet in a single layer and bake for 15-25 minutes, turning once with a spatula. Nuts should be bubbly and lightly browned. Remove from oven and cool completely. Break up the nuts and store in an airtight container. Preheat oven to 350 degrees. Spray 2 large baking sheets with nonstick spray, or line with parchment paper. Combine all ingredients except nuts in a medium saucepan over medium-high heat. Bring to a boil and cook until the sugar is dissolved. Remove from heat. Place nuts in a large bowl and pour the glaze over. Toss well to coat. Use a slotted spoon to transfer the nuts to the prepared baking sheets (discard any remaining glaze – or use with more nuts). Bake the nuts, uncovered, for 10-15 minutes until the nuts are golden. Cool completely and then break up the clumps. The original recipe I adapted this from used beans only. I thought it looked nice — and tasted better too — with beans and corn. This might seem like an odd time to be promoting a salad, rather than a warming cold-weather dish. But it’s the start of entertainment season, with Thanksgiving, Chanukah and soon enough Christmas and New Year upon us. This salad is a really good one for a potluck, brunch or party. It’s light on the dressing, and you can serve it with a single spoon rather than salad forks or tongs. And it’s quite attractive. If you want even more color, substitute some red or orange pepper for the celery. You can easily double it if you’re serving a crowd. 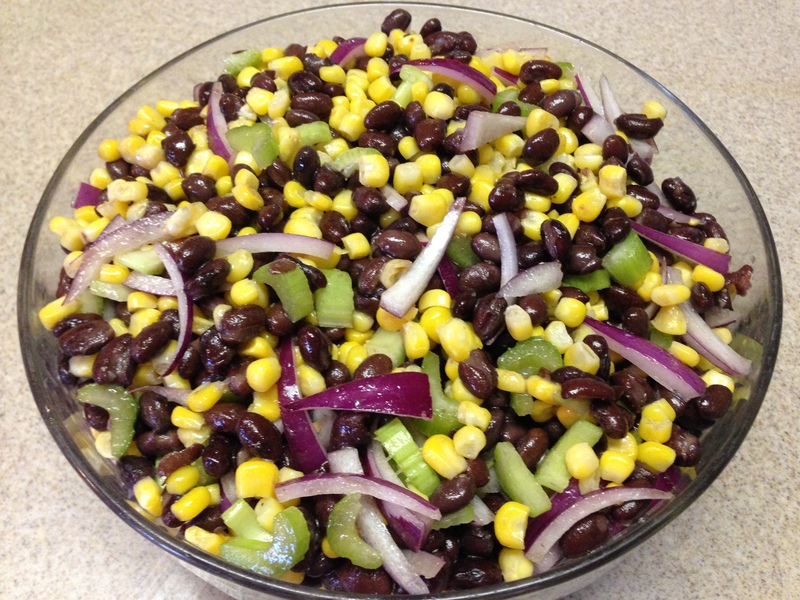 Combine celery, onion, black beans and corn in a bowl and toss well. Combine the lime juice, sugar, oil and cumin in a small bowl, and whisk until blended. Pour over the bean mixture and toss to coat. Allow the salad to sit for at least a few hours in the refrigerator or at room temperature for the flavors to mingle. Just in time for the Super Bowl — and a good recipe to take advantage of cheap avocados. At least in Detroit they’ve been cheap — we got some this week for 49 cents each! When we moved to Detroit in 1976, we lived in the Palmer Park, an apartment community inhabited primarily by young professionals and graduate students. The citizens’ council published a cookbook, What’s Cooking in Palmer Park. This recipe was contributed by Rob Musial, who called it Holey Moley Guacamole Dip and Neat Tree Trip – because after the recipe, Rob told readers how they could grow an avocado tree by sticking toothpicks in the avocado pit and suspending it for a few weeks with the pointy half in water; after it starts to sprout, you can plant it. Seems like everyone in the mid-70s had an avocado tree in their living room! 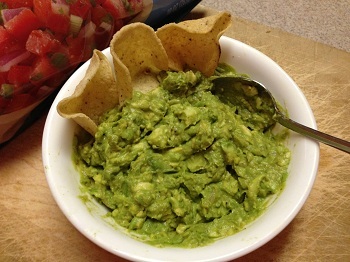 This was the first guacamole I ever made, and it’s among the best I’ve ever tasted. I altered the recipe only slightly. Rob’s recipe called for the inclusion of MSG, which I never use. And I like to add in a little chopped tomato. Thoroughly mash the avocado. Sprinkle it with lemon juice (or lime juice if you prefer) and stir well. Add remaining ingredients and stir. Chill for 1 hour before serving. Serve with corn or tortilla chips.